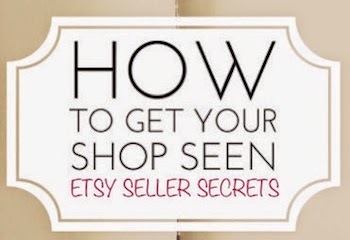 Have you been thinking about opening an Etsy shop? I know a handful of friends who are either thinking about it or have dabbled in it. I’ve even thought about it, but have not gotten past the pondering about it stage. It can be a bit intimidating! Opening a shop is one thing, but to then get yourself noticed and build a customer/ fan base is a whole other animal! Valarie started out with her own shop selling digital products and services on Etsy, but discovered how lonely it can feel out there! I know I feel the same way with blogging. I just don’ t have someone in my direct circle of friends who I can talk to, ask questions, or bounce ideas off of. Well, Valerie is here to be that connection for you! She has developed guides and tools that will help you. 1) Etsy Tools: She has developed some great tools that can help Etsy sellers get more exposure and visits to their shops, assist with your promotions, and more. If you are interested in any of the tools she offers,l come back and let me know. (You can send me a message through the message tab on the top right of my home page!) Valarie will help arrange a special discounted rate if you come from Tip Garden! 2) E-books: Proofpromo.com's ebooks are another great tool to help you get started with an Etsy shop and be successful for the long haul. They are worth your time!